Looking for remote codes for your Vizio Blu-ray Player? Here is the list with the KNOWN working device codes for Vizio Blu-Ray DVD players. These should work with ANY remote as these remote codes are universal. If these codes DO NOT WORK on your Vizio Blu Ray player, please leave a comment below and we will assist you and update our list. I am trying to program my Spectrum UR5U-8780L-TWC remote to operate my Vizio VBR122 Blu-ray player. The manual for the remote says it needs a three-digit code. I haven’t had any luck using the manual instructions. Onkyo RC-709M controller to Vizio VBR-121 Blu-Ray player. I have an Onkyo rc-590m remote and need a code for my Vizio vbr122. I have a Vizio blu-ray dvd and I’m trying to program a GE universal remote. Find the model number of your GE universal remote and do a search on Google to find out how to program it to your Vizio Blu-Ray player. If you cannot find out how, give us the model number of your GE remote and the model number of your Vizio Blu-Ray Player and we can find out for you. Vizio blue ray vbr220 to a Sony rm-pp412. 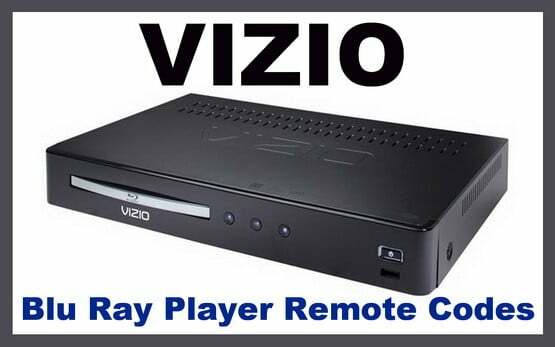 I need a code for a Vizio Blu Ray DVD model # VRB110. I am using DISH network. Could not get 4 digit code to work with RCA remote and Vizio Blu-ray player. Please let us know the model number of your Vizio Blu-Ray Player and we can supply you with the correct remote codes. I have a Vizio Blu-Ray vbr231 and a Philips srp5107wm/17 universal remote i can not find the code. -Press the DVD (or device) button and hold for 5 seconds until the LED flashes twice. LED will remain lit. -Find the programming code for your DVD (or device) in the code list BELOW and enter it using the Number Buttons. The LED flashes once after entering each digit. If the code is accepted, the LED flashes twice after the last digit is and then turns off. -Point the VIZIO remote control at the device and press the POWER button. If the device powers off, setup is complete. If not, repeat steps with a different code. I have a Philips SRU5106/27 remote control and can’t find a code anywhere for my Vizio Blu-ray player. The 2 – 4 digit codes listed on your site won’t work. My Blu-ray player is model # vbr210. Hope you can help, thanks! Try the 4 digit remote codes for dvd and blu-ray here. Try code 2563.